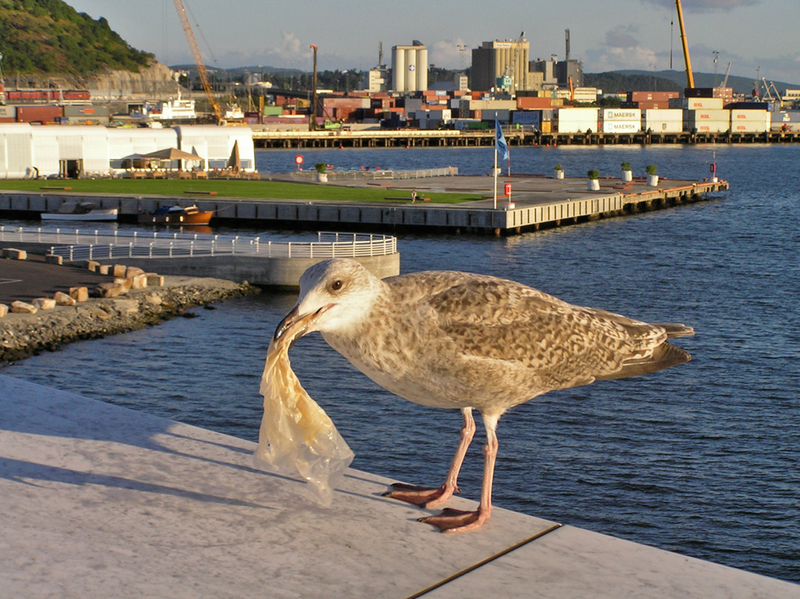 What was the gull doing with that plastic bag? 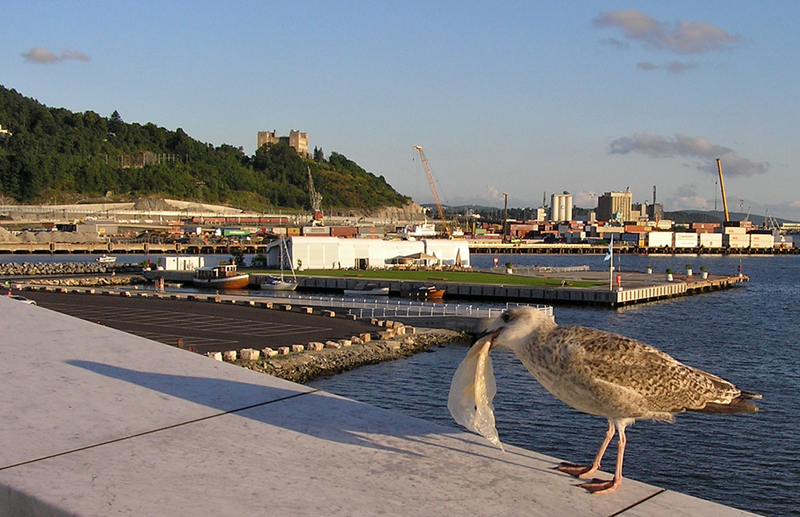 it looks like the bag may have got stuck in the gull’s throat. You’re right, m-l, poor thing! The photos are reversed, aren’t they? 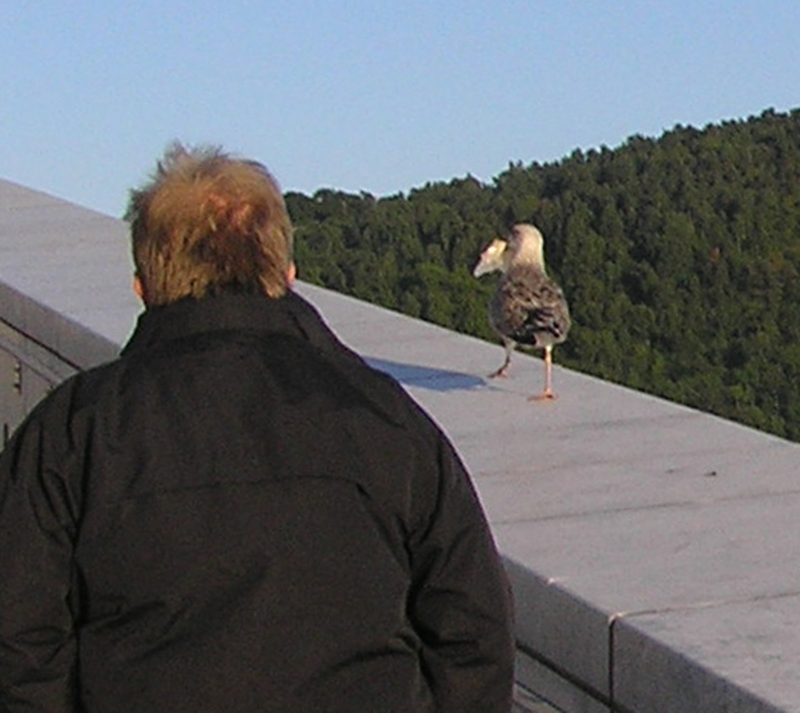 I’ve added photographic evidence to show that the gull was unharmed. Of course you might worry that the “last” picture could have been taken before the gull swallowed the bag, EXCEPT that if you see the direction it was walking and its relationship to the grey building (the one with two towers, on the ridge of the hill) in the second and final pictures, it is clear that it dropped the bag afterwards! Das glaube ich nicht, Jesús. 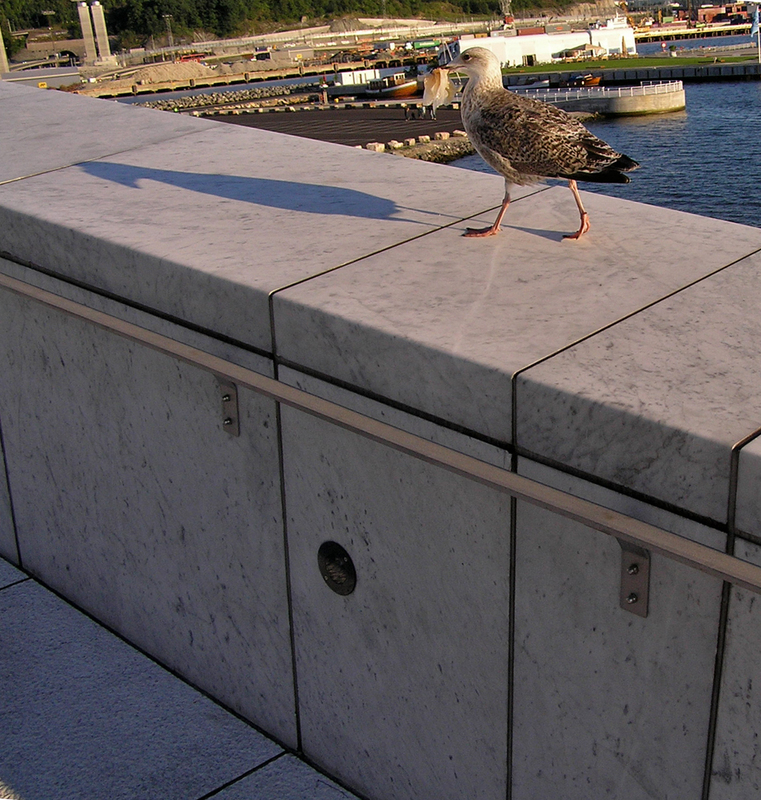 I had only seen 3 photos and the shadows of the gull seemed different. Obviously, I did a stupid remark. There are no stupid remarks here, J., except for mine, sometimes. And anyway, it’s hard to compare the shadow directions because some of the pictures and the wall are a little bit tilted. It seems that the “flagstones” haven’t equal dimensions either. That’s right. More in the next post. I did not expected less from you. … who’s written an opera of Chekhov’s The Seagull… I can’t find any trace of it playing here, unfortunately. Taking a rare night off I’m coming to Crown’s to relax, and what do I see? That yellow crane in the back is lifting scaffolding after my drawings. Or should be, if there were any. Back to work. Goodness, you’re working round there! Well, I feel better about those (museum?) buildings knowing they’re in your hands. The first block at Sørenga, another high end living quarter on an old container pier. I’m not exactly working there, but I’m there at meetings once or twice a fortnight. And I wouldn’t be too loud about knowing me right now. They started building far too early for us, and now we struggle from day to day to keep pace. Your pictures are older than I first thought, so I was wrong about the crane (the leftmost one, the other one is lifting containers in what’s left of the harbour). I think that one was used temporarily until the foundations for the big ones were ready. But the green piling machine in the first photo is working after my drawings. And the concrete wall in front of it is mine. If I’m not fooling myself by trying not to be fooled by the perspective, that’s the back wall of the block. Behind it, where the piling machine is working, is the underground parking below the central green field. Since these photos were taken they’ve built the foundation slab for the block from the back wall to the harbour front, and they’re now casting the basement walls. My pictures are from the beginning of August. How many storeys is your building? I’m guessing it’ll block the morning sun on the Opera, but never mind. Working with all that saltwater sounds tricky. I can’t wait to see it go up, you too probably. What I really want to see is what it’s all like when they take the road away. The existing container pier is about 2 m above defined sea level. The basement level restaurant floor will be about aone meter above the pier. Upon that there will be from five to seven numbered apartment floors (less to the right and in front, more to the left and behind), rising almost 3 m each. 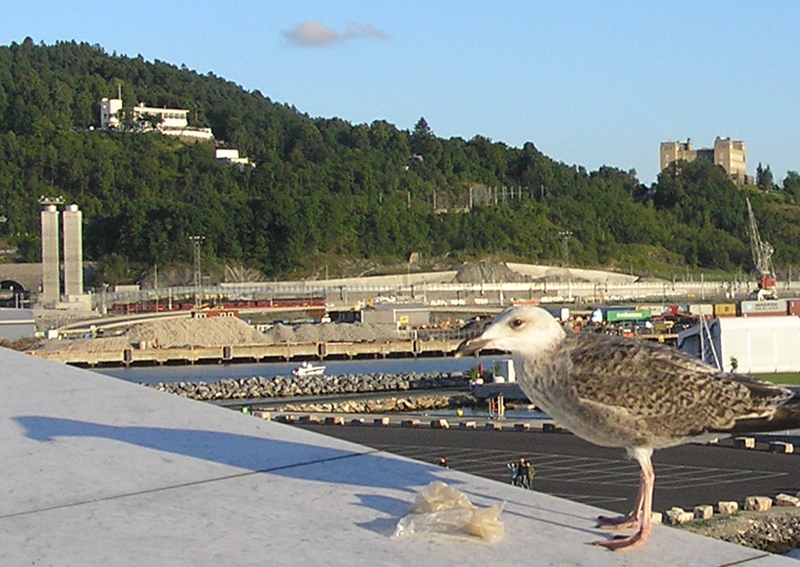 The top roof level will be some 27 m above the sea, or 25 m above the existing ground level. The salt is one thing, the fact that the ground is sinking by at least 1 cm a year and will keep doing so for a long time is another. And design for earthquakes, until recently not even considered in Norway, yet another. Working out the combined effects of the latter two took us half a year. I see that there are pictures at the architect’s website. One cm a year, hmm. Oh well, I’ll be dead by then. I have received a batch of old photos of my sister’s livingroom calf. No new ones, though, so it’ll have to wait till Christmas before I can report on her current size. These are from her first few days, though, and she’s disturbingly cat-sized.